View the original post on the Say Not Sweet Anne blog! Begin by sanding the edges and surface of your base. This will make the finished item look much nicer, and it only takes a second. Choose your base coat color and apply 1 even coat. Let dry and repeat until both sides of your base look even. Let dry. 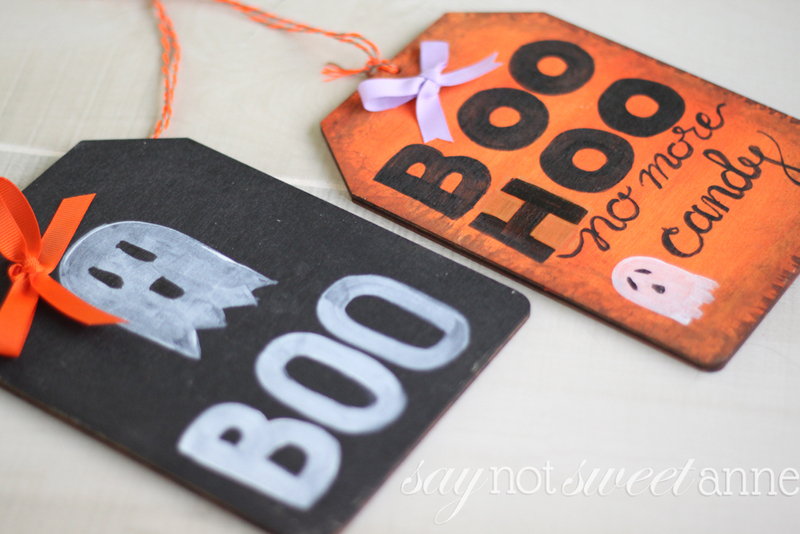 Using vinyl, stencils or freehand, write “BOO” on the front of the sign. I opted to add this adorable ghost, too. Once that is dry, write “BOO-HOO” and “No more Candy” on the back side. Add a bow or some other finishing touches to your sign. Finally, use the twine or string to hang the finished sign. You could place it in the center of a spooky wreath, hang it on a doorknob, or prop it up against some pumpkins on your front step.